Today I got this message in NetBeans: This client is too old to work with working copy 'projectX'; please get a newer Subversion client. That was a first for me. It is true I checked out the sources from a Subversion repository with a newly installed TortoiseSVN and probably the Subversion version was newer than the client in NetBeans. Luckily it is easy to change the default client and use a newer client for Subversion. We only have to go to Tools | Options | Miscellaneous | Versioning | Subversion. 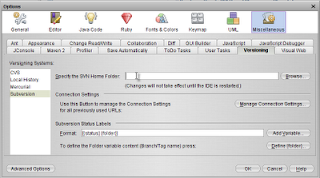 There we have a input field Specify the SVN home folder with a Browse button. Here we can specify where we installed our latest Subversion client software. Another way to use a newer Subversion client is to put the latest Subversion client in the PATH environment variable and then start NetBeans.